Brush and Baren: Linocut in Progr... Finished! I woke up yesterday morning determined to finish this linocut, no matter what. I'd been waiting a couple of days again for ink to dry, and it was testing my patience mightily. Thankfully a friend called on Wednesday to see if I was up for the trip to Portland for the weekly tango practica. Yes! Good to dance, and good to be away from the studio, where the temptation to rush things was high. Not so good was the return journey at 10:00pm in an unexpected snow storm, but hey... that's a different story. Oh, wait. We have to back up a couple of days first. Remember? I wanted one more run of a darkish, transparent blue-black. Which was this. I was feeling pretty good at this point, and wanted to just charge ahead and finish the birds. But with 12 other ink layers underneath, it was imperative to wait for this color pass to dry enough. Charging ahead would mean risking damage to this layer and possible adhesion problems with the next. Which finally brings me back to yesterday. 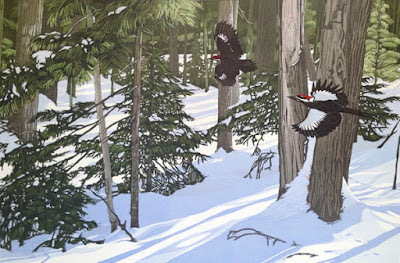 The birds which have emerged to dash through the forest are pileated woodpeckers. Their bright red crests were allegedly the inspiration for the cartoon character Woody Woodpecker, but there wasn't anything funny about printing those tiny little shapes. I wanted the bird in the middle ground to appear... well, in the middle ground. More in shadow than the foreground bird. It was a decision which required mixing two different blobs of ink, using two ink knives, two brayers. A lot of work and mess for two tiny little bits of color. My smallest brayer is an inch wide... too wide, really, for these shapes, so I also took the time to wipe extraneous ink from the block before printing. Now would NOT be the time to get careless. 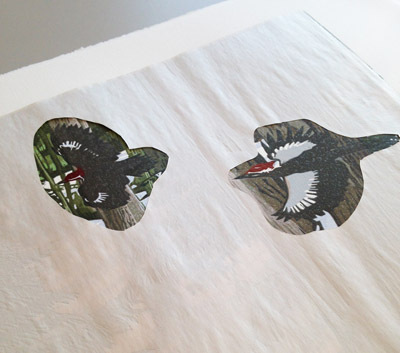 I also cut newsprint masks to cover all but the birds before printing, as added protection against extraneous color. Apparently I didn't take a photo of the prints after the red bits were applied... but honestly, there wasn't that much to see. All done! Slightly embiggenable with a click if you want to see more details. Whew! That was a journey and a half. It's still lacking a title... I'm thinking about something with the word "chase" in it... Chasing Shadows? Possibly. I need to sit with the happily drying prints for a little bit yet. So... what's next? I'm not sure. Perhaps something smaller and simpler that I can finish quickly! One more snow scene, maybe– before I stop chasing shadows and start chasing spring. It's lovely, Sherrie. And, knowing how testing (I'm being super-polite! )reductions can be...Big high five! Thanks, Dinahmow! Wow... seems like a long time since I've "seen" you around the interwebs. Thanks for stopping to say hello! 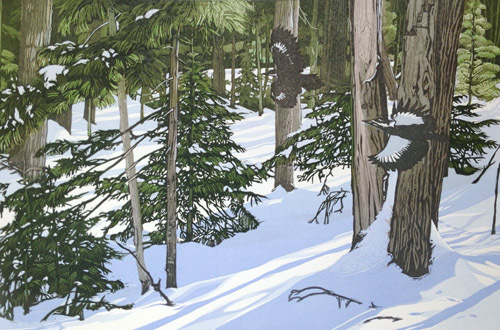 Sherrie, the new print is lovely, such a feeling of depth, movement and stillness. It gives me a feeling of winter calmness...which I'll need as Oregon gets sucker punched with nights of 26 this week. I've got camellias in full bloom. Dang it. Oh, Patrick! You have been on my mind... we should chat soon. Camellias and 26 are not a good pairing, fingers crossed for your blooms and arms thrown wide to hug you! Probably my 'current' favorite ('til the next one)! You keep raising the bar and always seem to stick the landing! What was the print size on this one? You may have mentioned it and I didn't notice. Can't wait to see what's next! It's 12" x 18"... whew! :-) Thanks for the "unknown" cheering section! Wow! After working on our basic linocuts with you at Audubon on Sunday, it is amazing to see the depth and richness of your work. 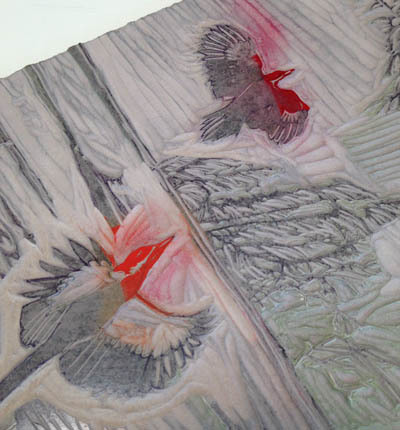 A baren, in case you didn't know, is a rubbing pad used when pulling relief prints by hand. Traditional barens were made of bamboo, but there are modern versions in plastic and mesh. Of course, a lot of the time I just use a spoon. Unless otherwise noted, all images and text are copyright Sherrie York. If you would like to share any images, please ask first. I'm a Blick Art Materials Affiliate! Check out this GREAT self-promotion guide! Linocut in Progress: No, really!